In the Posts Carousel module, a set of posts or pages is displayed as a single row of posts in either Grid layout (with post title and info underneath the featured image) or Gallery view (with post title and info replacing the featured image on mouseover), as shown in the following screenshots of the two layouts. Autoplay, looping of the posts, and navigation icons (dots, arrows) are all optional. Tip: Not sure which Posts module to use? See the comparison article. Layout Grid displays the post title and post info below the featured image. Gallery displays the featured image, with post title and info replacing the featured image on mouseover. 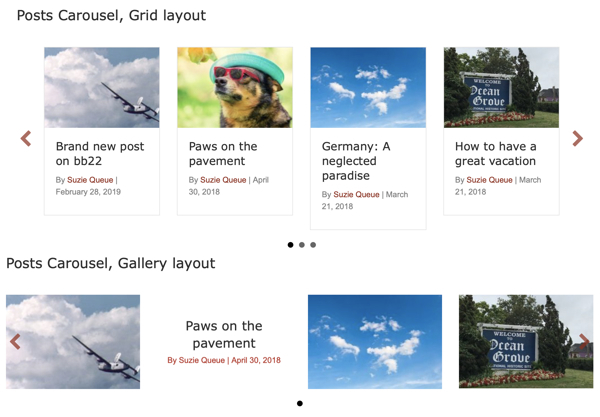 In Grid layout, you can hide the featured image on the Layout tab, with the result that the post info displays where the image normally appears. Gallery layout does not have the option to hide the featured image, since the result would be the same as for Grid layout. Advances the display of posts or pages forward by the number in this field. By default the value is 1. Posts Post max width Determines the maximum width of each post in the list. Depending on display width of the browser, a larger max width means larger featured images and fewer items visible in the carousel row. As browser width decreases, the display decreases to a single item and eventually the width of that single item decreases. Post spacing Number of pixels between posts in the list. If set to Yes, the border around every post is the same size. The type of animation when the post title and post info replace the featured image on mouseover. Show or hide the featured image. Crop Crops the featured image to a particular shape. Note that this may cut out some parts of the image. (Gallery layout only) Use icon for posts Choose Yes to display an icon on the line above or below the text when the post title and post info are displayed on mouseover. Choose the icon to be displayed. Choose whether the icon appears above or below the post title and post info. Specify icon size in pixels. (Grid layout only) Content Show or hide post content. If set to Yes, the entire post excerpt is displayed, if the post has content in the Excerpt field. If there's no excerpt, the WordPress default of the first 55 words of the post content is displayed, with an ellipsis of three dots at the end to show there is more content. Post icon color If you set an icon for a Gallery layout, you can set the post icon color here. Text background opacity Opacity of the text background color.